Result: Chimps score better than we do on multiple choice tests. If you have 5 linked sources and strong Purposeful Summaries, assign yourself 5 more sources in your Reply. If you don’t have 5 linked sources and strong Purposeful Summaries, assign yourself that task in your Reply. I hope you believe them to be true, but that’s beside the point. They are worth remembering even if you dispute them. Replies always welcome and encouraged. We started class with a discussion on penalty shot statistics. From 36 feet away, every penalty shot is 75% successful. However there is a 98% chance the goalie does not move but do you strike down the middle? 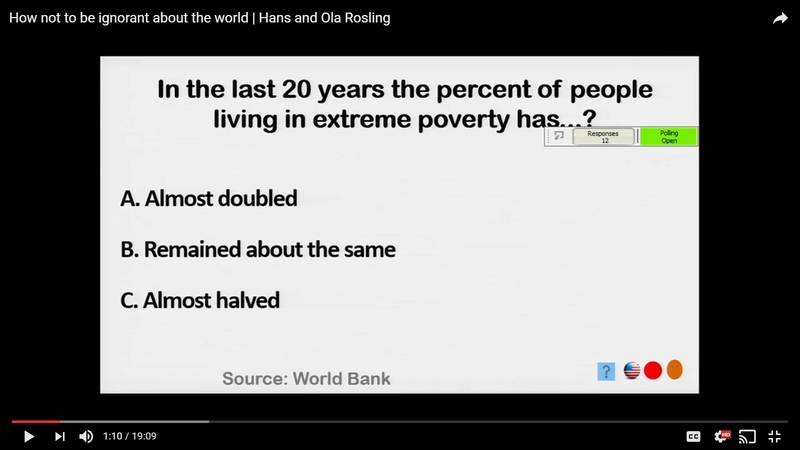 We watched a video on the master statistician Hans Rosling. 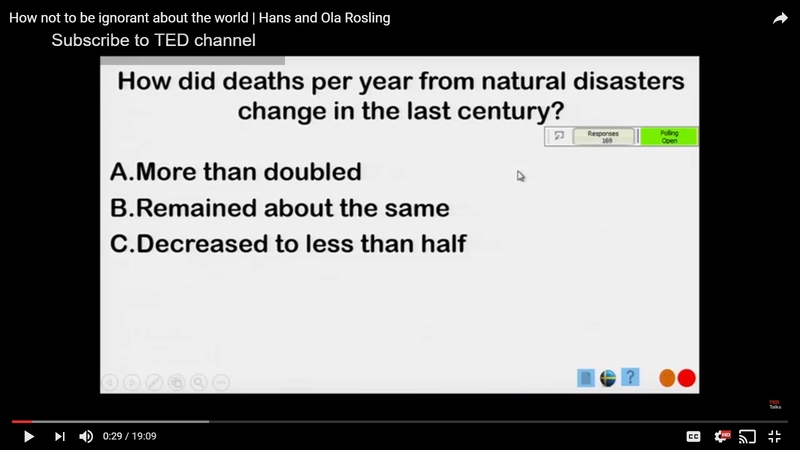 Rosling discussed how he gave out a pretest to his first ever stats class he taught and was surprised that preconceived notions got on the way of actual stats. Being a good writer means you have to be a good thinker, letting the world surprise you and being able to share it. Skewed Info+Intuition= ignorance. That might not always (probably won’t always) be enough for 3/3, but today it qualifies. Replies always welcome and encouraged. -We talked about the odds of making a penalty shot and the fact that nobody kicks it down the middle even though there is better odds. This is because if you kick it down the middle and the goalie does not move you will look like an idiot and never live that down. But if the goalie made a diving save to your shot your teammates can’t possibly be mad with you and think your an idiot. -you have to be willing to take a chance and examine material and reveal what is interesting about it and allow the world to surprise you. Chippy, I’m awarding 3 points today wherever I find a unique or well-expressed opinion. You earned yours not for a particular note, but for overall strength of recording and analysis. I wonder if you’d care to share what was most surprising, most memorable, most rewarding, least boring, about today’s class. Replies always welcome and encouraged. We did watch “a TED talk about global trends in health and economics,” Starbucks, but that was far from the point of our watching it. Sharks aren’t dangerous. But most people don’t live near the ocean. It is still low for people that spend a lot of time in the ocean but its higher. Most people are around the median. Social change first then rich for countries. It probably won’t happen again. Competition for excellence in notes is very high in this class. But it’s good enough for today. Preconceived notion are often not rational but are not challenged because they are accepted ad the norm. Having new ideas expressed clearly makes for good writing. Examine material in a way that provides new insight. Preconceived come from places like personal bias, outdated world views and news bias, mixed with intuition creates an illusion of confidence. When guessing usually assume things get better. -We all have preconceptions in our research. As shown in the ted talk, the students, as well as the professors, answered incorrectly on the child-death chart because of preconceived notions about the world. -Writing: Have a complex idea, describe it completely. -This course was designed to help us critically think and examine, in order to write effectively. -News outlets, and the old things we were taught are what cause us to have false information, once intuition is added. It might not happen again. Competition for excellence in notes is very high in this class. But it’s good enough for today. Replies always welcome and encouraged. “If you don’t know how to pronounce a word, pronounce it loud.” Better to be wrong and sure, than wrong and have no idea what you’re talking about. Thinking about the problem gave them the wrong answer instead of the right answer because of preconceived notions. Learn to examine the material in front of you, clearly to someone before you can write well. Be willing to take a chance and examine material to reveal what’s interesting about it. Be open to new ideas. Don’t be so close-minded. It’s as if you attend class, ignore all the details, synthesize the lessons, and record the morals. Replies always welcome and encouraged, especially from you because you’re not good at replying. How to shoot a penalty shot? You can shoot left, right, or down the middle. The odds are 57/41- the goalie will go the strong side 57% of the time, the weak side 41%, and will stay in the middle 2%. Which side should you pick? If you pick the middle, and the goalie doesn’t move, you risk looking like an idiot to your team and everybody else watching. If you pick a strong or weak side and the goalie saves it, at least you won’t look as bad as you would if you kicked it down the middle and the goalie didn’t have to move to save it. Professor surveyed students on Global studies questions. Students got most answers wrong because of pre-conceptions that made them already have views about other countries/continents that were taught to them in school. If they just randomly guessed about the questions they could have done better than they did when they thought about the question. Students tend to associate things that happen in small parts of countries and associate it with whole continents. Why do we answer questions of off preconceived ideas? Everything gets worse. Rule of thumb: Most things improve- Try going for the conclusion that things gets better. Rich or poor. Rule of thumb: One hump-don’t categorize people into rich or poor, think of most people as in the middle. First rich, then social. Rule of thumb: First social, then rich. Sharks are dangerous. Rule of thumb: Sharks kill few- very small number of people die from shark bites. What I like best about your Notes, Aeks, is that they aren’t momentary, fragmentary transcriptions of what was said; they’re thoughtful and reasoned, half-digested summaries you manage to make on the fly. Replies always welcome and encouraged. –Generally the trend was small families and long lives, and large families and short ives. Good for you, GreenEggs. That’s certainly part of the message. The rest is, no matter how much we think, we’re at the mercy of our ingrained bias and upbringing. Objectivity is very hard to earn. Thanks for responding. 36 feet to victory. Taking a penalty shot has a 75% chance of success while at the pro world cup level. In a third of a second, the ball will be at the net. This implies that the goalie does not have a chance. The goalie must predict where the ball will be kicked in order to prevent the goal. Numbers make this scenario crazy! There are more than I can even type! There is only 2 % chance that the goalie will stand in the middle of the goal. Point of story is human nature. People do not want to look like an idiot. So even though the odds are greatly in the favor of kicking down the middle, if the goalie stays in the middle the kicker will be called an idiot for “making it easy” for the goalie. 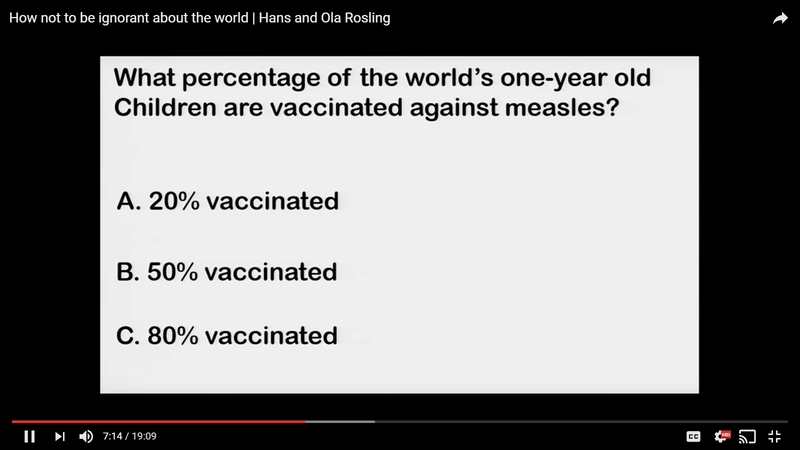 -Hans Rosling is a dorky old guy with accent. -He asked his students to decipher the higher child mortality rate between a pair of countries and the answers were not what was expected. -Random selection by chimpanzees resulted with more correct answers than that of the smartest students within Sweden. This alludes that “background knowledge” actually causes poor answers and shows the true lack of knowledge. -The world has changed so much through the years but our views of the world have remained stagnant. This poor background knowledge least poor misconceptions. -No longer fair to look at the world with what used to be true. How not to be ignorant. Must explain BS super beautifully for it to be considered good. Examine the world! Allow it to surprise you! Planning for the future requires us to know the truth of the present. Tips for beating the chimps! Keep an open mind. What is assumed could very well not be true. Assign 5 sources to my proposal ! 5 purposeful summaries ! Work to be done! HAVE A COMPLEX IDEA, EXPRESS IT CLEARLY (sorry for shouting).